MWS ST/SR2 Microwave Single Point Sensor - HiTECH Technologies, Inc.
MWS-ST/SR-2 type microwave sensor is a level switch which consists of a transmitter and a receiver, installed face to face. It comes with four channels to allow for installation of multiple sets in close proximity. The transmitter transmits microwaves toward the receiver and an output relay in the receiver is released when the beam is obstructed. Harsh environments may result in the buildup of contaminants on the sensing surfaces, however, the sensor easily penetrates this buildup, thanks to the high penetrability of microwaves. For flow/non-flow detection & Block chute detection. 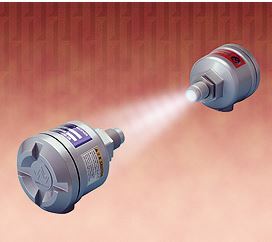 The MWS-ST/SR level switch is the first of its kind to utilize the heterodyne detection method rather that the now obsolete, diode detection method.